Check out these solid Crease Monkey lacrosse pinnies made to order. Make your own crew reversible jerseys in any color or style from Lightning Wear. We manufacture all of our reversible pinnies in Maryland USA. Our company ships all over the globe. Check out the Worst dad ever. Create your own horse pinnies with any design pattern or color. 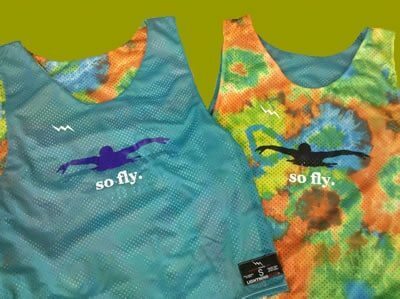 So Fly Swim Team Pinnies and Tye Die Pinnies from Lightning Wear®. Create your own Honey Badgers Lacrosse Pinnies from Lightning Wear. Sup wit it pinnies and Sup wit it Rasta Pinnies Rasta Lacrosse Pinnies from Lightning Wear®. Womens Reversible Lacrosse Jerseys from Lightning Wear. Take a look at these India Reversible Mesh Jerseys made to order in Maryland USA. If you are planning a class trip or event that involves travel, you are not packed and ready until you get your custom reverisble jerseys. This is a great way for you and your pals to stand out like tourists in any nation or land. Add custom names numbers and patterns at the click of a mouse.